If one of your cats loves catnip, you're probably hooked on this easy-to-grow perennial. 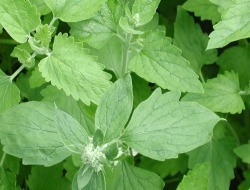 Catnip (Nepeta cataria as well as other Nepeta species) is actually part of the mint family. Site: Give catnip rich, well-drained soil. It tolerates most soil conditions (pH 6.1 to 7.8) but does like regular watering and partial to full sun. Catnip can have an aroma that's a cross between peppermint and skunk. It isn't to everyone's taste so keep plants away from your deck or patio. Most catnip varieties grow to a height of about three to four feet, and plants can get top-heavy with large serrated leaves, toppling over in an untidy heap when it rains or when the wind blows. Harvesting: Harvest leaves when the plant reaches eight inches. You can take leaves throughout the summer and dry them in the oven or a dehydrator. Pinch back flowers as they appear to stimulate leaf growth. Never take more than half the plant in a single cutting. In fall, cut stems, tie small bunches with a rubber band, and hang them upside down to dry in a dark spot that gets plenty of air flow.